To most people a “hut” conjures the image of a dingy shack hidden in the woods. Only in Aspen can a hut morph into a beautiful mountain refuge set in a stunning location. After you’ve made a journey to one the huts around Aspen, a hut becomes far more than mere refuge. It is a home away from home, a sanctuary from the frenetic world, an invitation to adventure, and a place of love and laughter where friends gather, new and old. The Benedict Huts are artistically designed mountain chalets perched together on a timbered hilltop just six miles from Aspen. Their windows overlook snow-covered meadows and distant peaks. Access starts right from town, up the Smuggler Road, followed by a long, steady climb through a spruce-fir forest mantled with pillows of downy snow. The Benedict Huts are arranged as a pair because they memorialize Fritz and Fabi Benedict, two beloved Aspenites. Dr. Ben Eiseman, a friend of the McNamara family, raised funds for these huts, which were built in 1982. The Forest Service permitted them with the caveat that if they were not successful, both huts would be torn down, the sites reclaimed. Success was proven, and today the 10th Mountain manages 34 huts, from Aspen to Vail to Summit County, spread over 300 miles of trails radiating north and east of Aspen. To the south of Aspen is another set of huts, a favorite of which is the Goodwin-Green. Dwarfed in its high elevation, tree-line setting at the far end of Richmond Ridge, this tiny gem of a hut has Shangri-la qualities. During winter storms it is known to magically appear and disappear at the whim of the weather. Errant hut trippers tell epic stories of trying to find this Hobbit-like shelter as snow blows, daylight dims and temperatures plummet. If you really want to stretch your capabilities, the tour over dramatic 12,700-foot Pearl Pass to the Friends’ Hut, between Aspen and Crested Butte, is a focused exercise in avalanche risk assessment, route-finding, compass reading, and discretion on if, or when, to turn back. The Friends’ Hut is booked through the 10th Mountain Huts, but it was built independently in the early 1980s as a memorial to ten friends from Crested Butte and Aspen who died in a freak, head-on plane crash over East Maroon Pass in 1980. All of the huts may be booked on advance reservations, either online or by phone. But that’s the easy part. Getting to and from most huts requires a degree of map reading skills, mountain fitness, functional gear, and a willing attitude. The huts come with wood-burning heat and propane cooking stoves, utensils, solar-powered lights, bunks, outhouse, and a cozy ambiance. Visitors bring sleeping bags, food and personal clothing and equipment. Essential ingredients to any successful hut trip are mountain savvy and winter preparedness. Most of the routes are demanding and laborious at high elevations. And with fresh snow, trail breaking becomes a team activity that can sorely test even the most stout-hearted men and women. 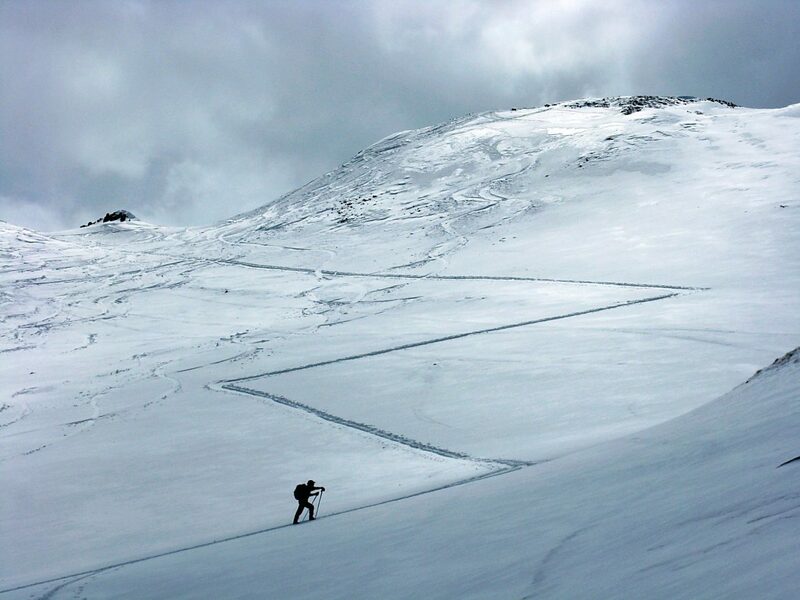 Many of the Braun Hut routes are exposed to some avalanche risk, while the 10th Huts are mostly without. Awareness of avalanche and weather conditions is essential. The huts of Aspen have become popular because of the opportunities they provide for peace, quiet and natural beauty. That’s why hut users run the gambit from retirees to school children, from cancer survivors to combat veterans. Huts For Vets is a nonprofit based in Aspen that uses Margy’s Hut as a summer sanctuary for combat veterans seeking serenity and healing from the invisible wounds of war (www.hutsforvets.org). The huts of Aspen are world class amenities. They draw backcountry aficionados into the wild to celebrate camaraderie, downhome comfort and the many joys of what nature has provided so richly in these mountains we call home. Editor’s note: Paul Andersen is an Aspen Times columnist, contributing writer and book author. He is executive director of Huts For Vets and an avid hut tripper. This story originally appeared in Winter in Aspen, a free winter guide-style magazine currently available on racks and in hotels throughout town.